Join the former Prime Minister on a voyage to the Antarctic Peninsula with Ponant in November. Meet former Prime Minister Bob Hawke and see Antarctica aboard an 11-night voyage from Puntas Arenas, Chile, with expedition cruise line Ponant. Hawke will be on board Le Boreal for the Chile to the Antarctic Peninsula cruise, departing on November 17. The voyage aims to highlight the importance of scientific understanding and preservation of the polar regions through sponsorship of NGO Le Cercle Polaire, of which Hawke is the honorary president. He'll be joined on the voyage by the organisation's founding president Laurent Mayet. Along with the late former French Prime Minister Michel Rocard, Hawke played a major role in the adoption of the Madrid Protocol, part of the Antarctic Treaty System that bans mining in Antarctica and requires that activities including tourism are subject to environmental assessment. 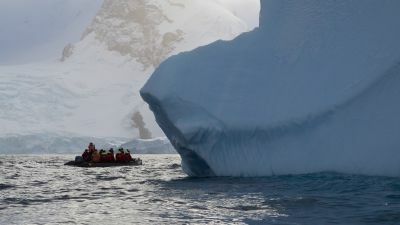 The journey will also include Zodiac outings and shore visits with naturalist guides, the possibility of hikes, visits to scientific research stations and former whaling stations, and the chance to spot wildlife including penguins, whales, seals and sea birds. The cruise costs from $11,191 per person twin share in a superior stateroom. The price includes flights from Santiago to Punta Arenas at the beginning of the trip, plus a flight from the disembarkation port of Ushuaia to Buenos Aires. For more on the voyage, phone 1300 737 178 or see ponant.com or your travel agent. See lecerclepolaire.com for more information on Le Cercle Polaire.